The Ibero-American Model Forest Network (IAMFN) is a voluntary partnership among model forests working together to pursue a common aim of good governance over natural resources and backed by government representatives from each member country. The IAMFN is a member of the International Model Forest Network. Thus, as part of a worldwide network, lessons learned at the regional level are scaled up at a larger scale. Model forests appeared in Latin America during the second half of the 90s, stimulated by the cooperation from the Canadian Government that facilitated information and the dissemination of its experiences. The first model forest in the region was established on the island of Chiloé in 1996 which is located in the South of Chile. Argentina assumed the commitment of having one model forest per forest region. 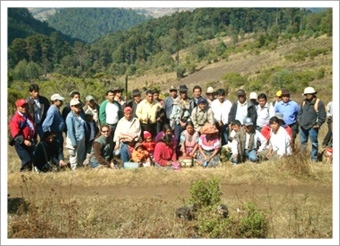 In 2002, a model forest from the Dominican Republic joined the IMFN. Thus among Chile, Argentina and the Dominican Republic, a regional network began at the UNDP facilities in Chile until year 2004 when Brazil and Costa Rica also joined this initiative, composed then by 5 countries and 11 model forests. Starting year 2004, the Latin America and the Caribbean Model Forest Network (LAC-Net) changed its headquarters to CATIE, Costa Rica, where the Network Chairmanship and Management is now located. With the inclusion of Spain to this regional network, the Board of Directors decided to change its name to Ibero-American Model Forest Network (IAMFN) in November, 2007. In 2008, the IAMFN had 18 model forests in eleven countries of Latina America, the Caribbean and Spain.